Home/Nuclear Medicine/Blog/Biodex announces the release of its NEW 2014 Nuclear Medicine and Molecular Imaging Supplies and Accessories Catalog with up-to-date content and detailed product information. 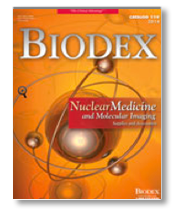 Biodex announces the release of its NEW 2014 Nuclear Medicine and Molecular Imaging Supplies and Accessories Catalog with up-to-date content and detailed product information. There are exciting new products and upgrades to existing products that we are sure you will find interesting. We have added a Clear-Lead™ Mobile Radiation Barrier and a Tabletop Shield to our shielding and storage product line. Both provide optimum protection from radiation, making them must haves for any nuclear medicine department. DICOM compatibility is now offered for the Atomlab™ 960 Thyroid Uptake System. The optional software integrates the Atomlab 960 with your hospital management system, streamlining workflows and improving communication. Some products have been redesigned, such as our popular line of Pro-Tec Syringe Shields. They are now more durable with a new lock design, easy to change glass and better visibility. To read about all the new products and enhancements, along with our entire line of Nuclear Medicine and Molecular Imaging supplies and accessories, download the catalog today. Now offered in a convenient online format - the digital version of the catalog provides immediate access and allows you to file or share selected electronic product pages with peers, supervisors or to accompany an internal purchase request.